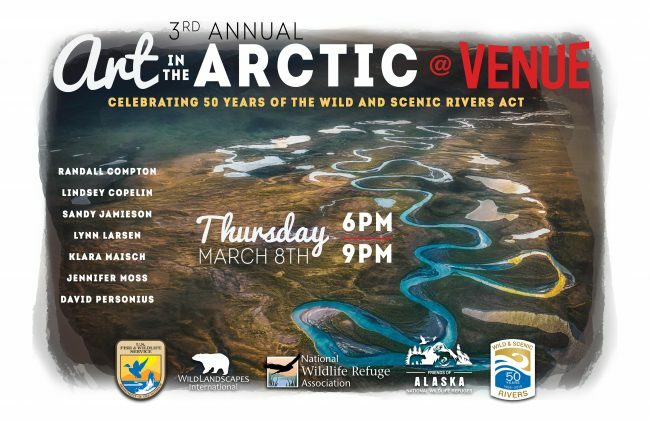 On a beautiful spring evening in May, a small group of Friends of Alaska National Wildlife Refuges members joined a handful of U.S. 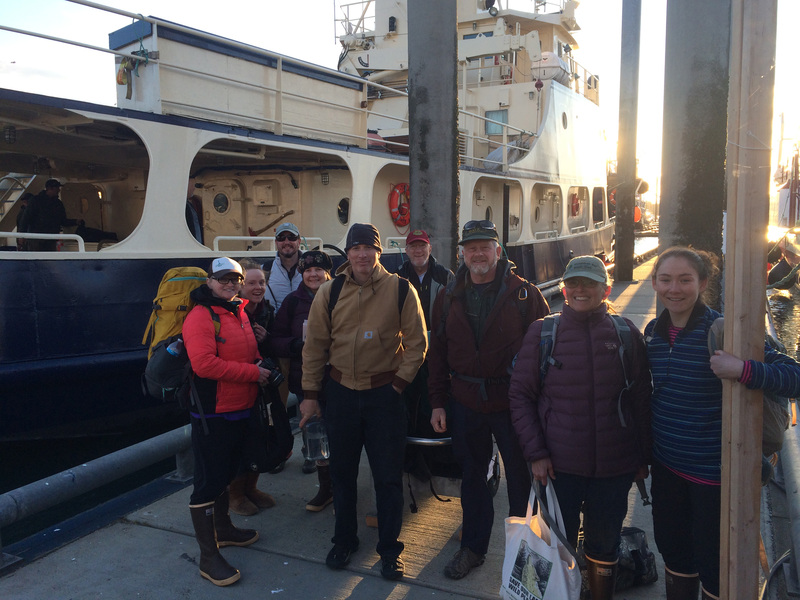 Fish & Wildlife Service employees aboard the FWS research vessel Tiglax on an overnight trip to visit the wild, remote Barren Islands. 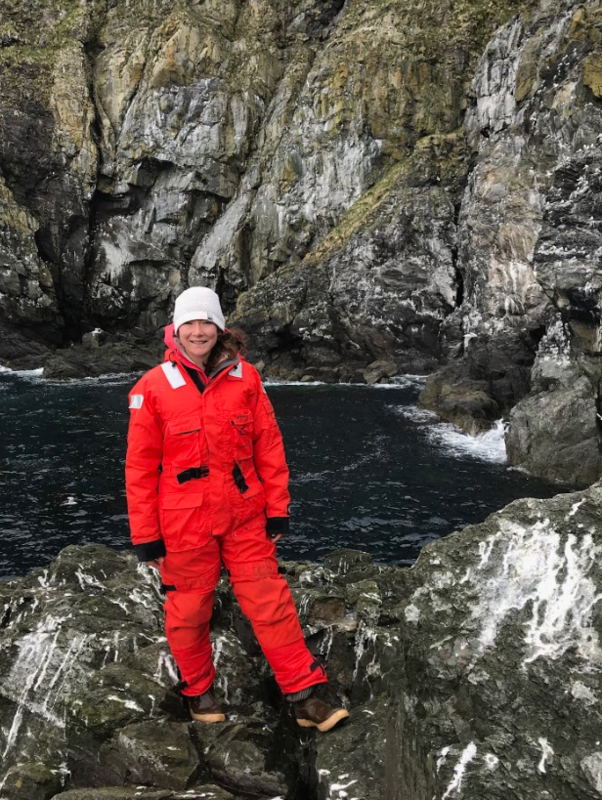 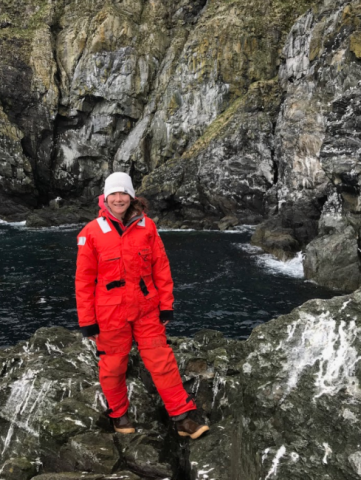 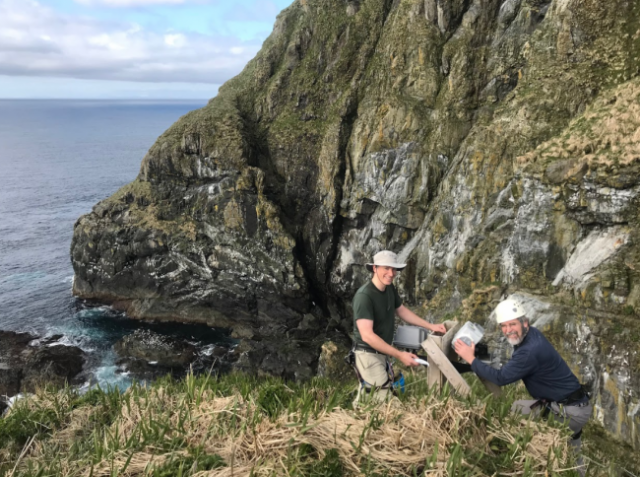 Located just 60 miles from Homer, between the tip of the Kenai Peninsula and Kodiak, the Barren Islands are a part of the Alaska Maritime National Wildlife Refuge and home to the largest seabird colony in the northern Gulf of Alaska. 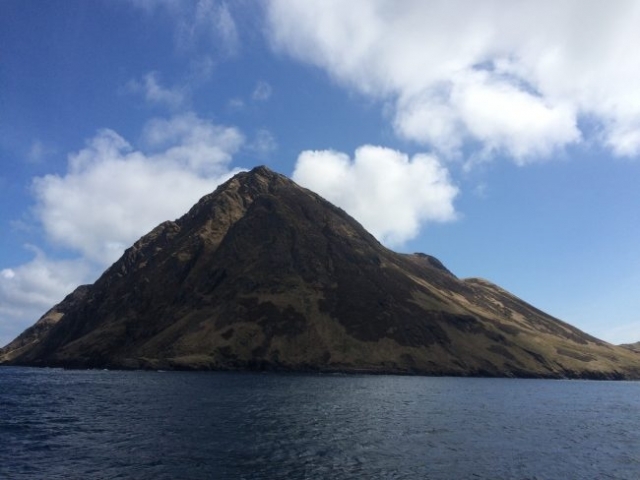 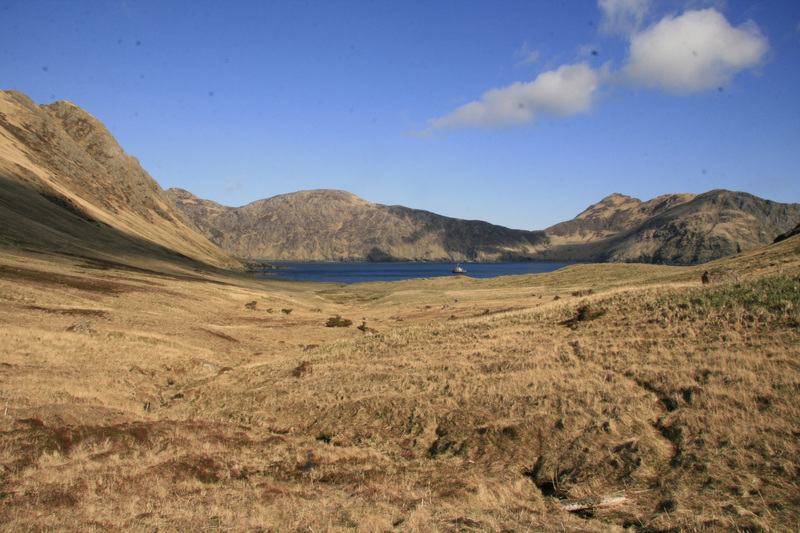 During this 24-hour trip, FWS employees installed bird cams on one of the islands, while Friends members rode a zodiac to another island and spent a couple of hours hiking across sand dunes, through tall grasses and up to elevation with 360 degree views of the surrounding rugged, surreal landscape. 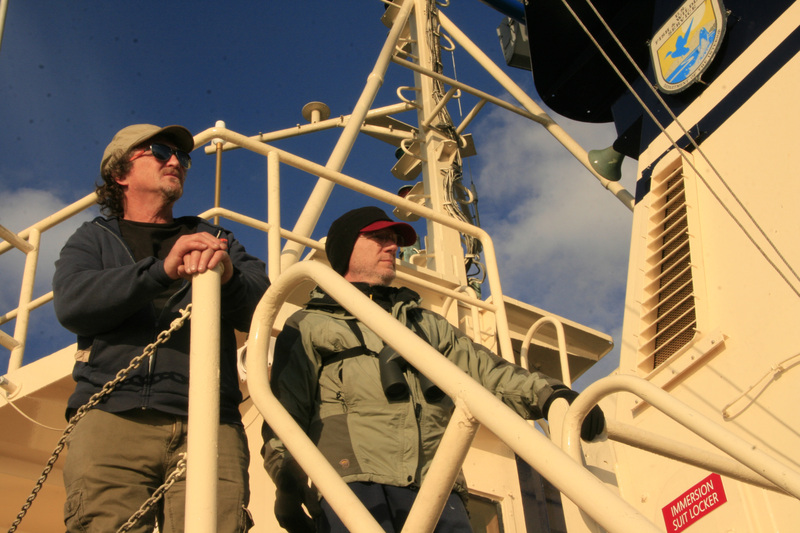 Invited to join the ship’s crew and FWS staff to visit this seldom-visited area of the refuge, on what might typically be an evening and day of weather, we enjoyed calm seas, beautiful skies, spectacular views, tasty meals and lots of time interacting with crew and staff during this unique and special opportunity to learn about a FWS project and a little glimpse into life aboard the ship. 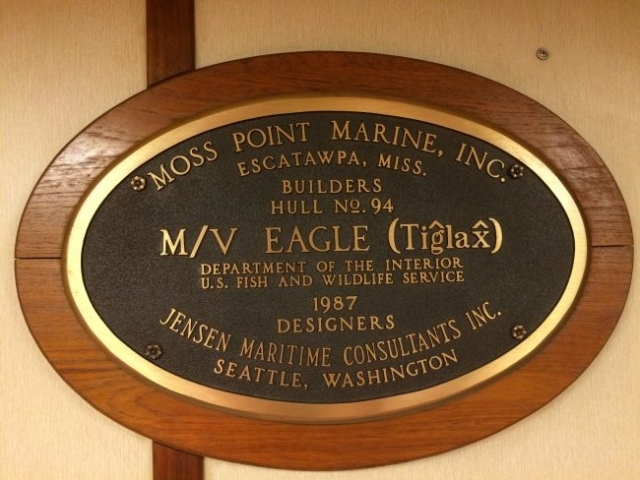 The r/v Tiglax, Aleut for Eagle, provides critical support for biological work, management programs, and village outreach and education. 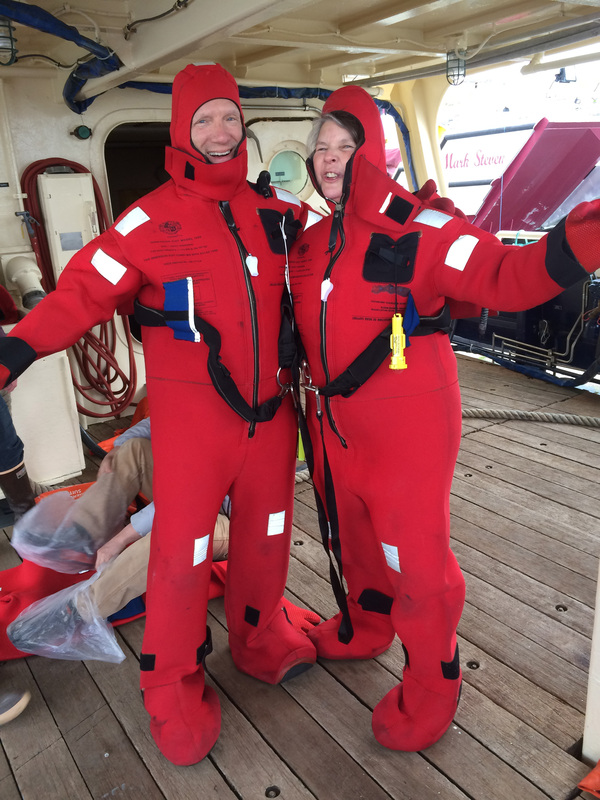 Thanks to Refuge Manager, Steve Delahanty and the ship’s crew for allowing us on board. 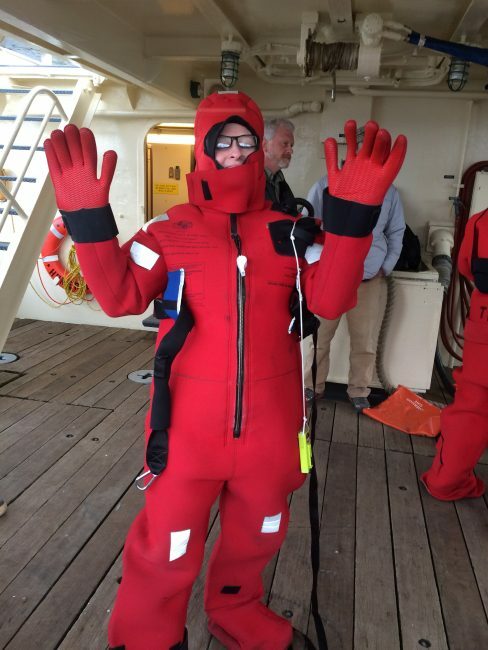 Joining Christina Whiting on the ship were Friends members, Brenda Dolma, James Dolma, Louise Ashmun, David Schroyer and Anthony Munter and FWS staff Arthur Kettle, Aaron Christ and Jaclyn Lucas. 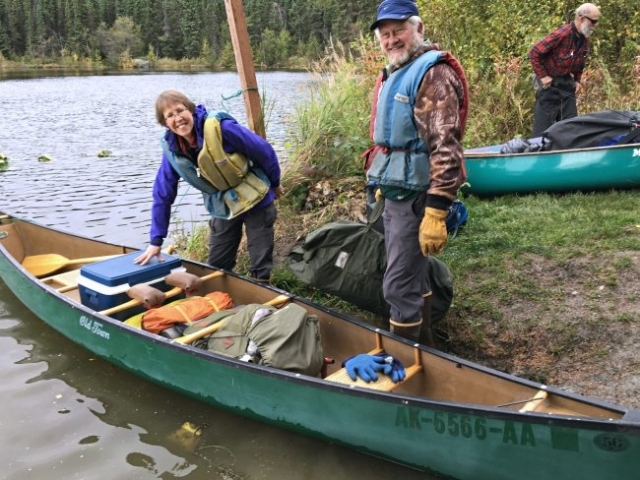 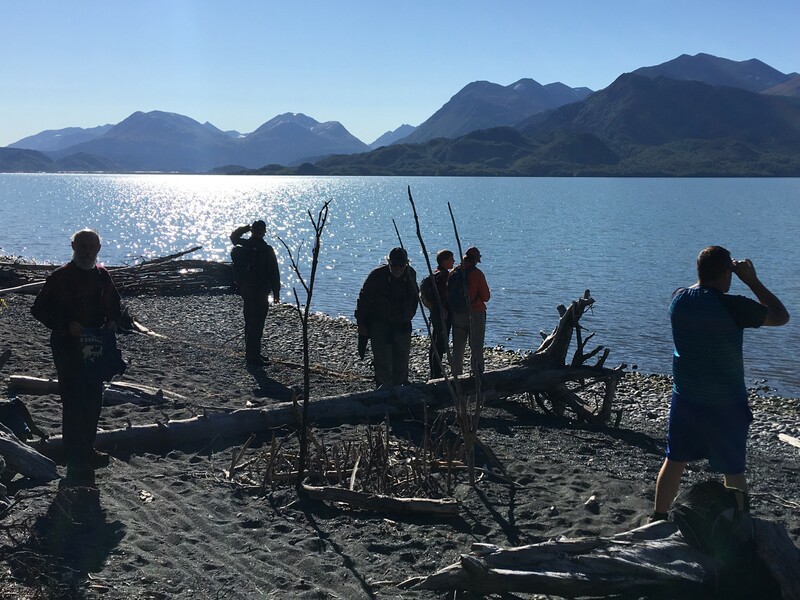 Over a long Memorial Day Weekend, a 12 member cadre of refuge friends from around Alaska embarked on an exploration of Tetlin National Wildlife Refuge. 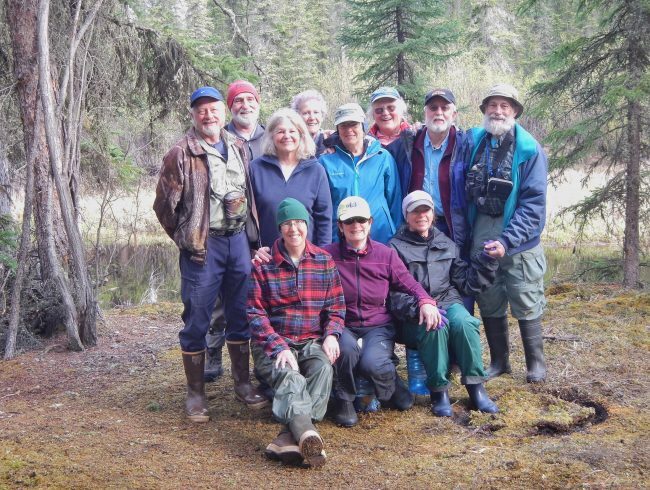 The group included some new friends as well as “old timers.” The group met up at Refuge Headquarters in Tok. On Thursday afternoon, Mary Timm, the retired Tetlin Refuge Educator and her husband Hank, invited us to their home to visit and chat about “all things Tetlin.” Over pizza and salad, they shared their extensive knowledge about the wildlife refuge. 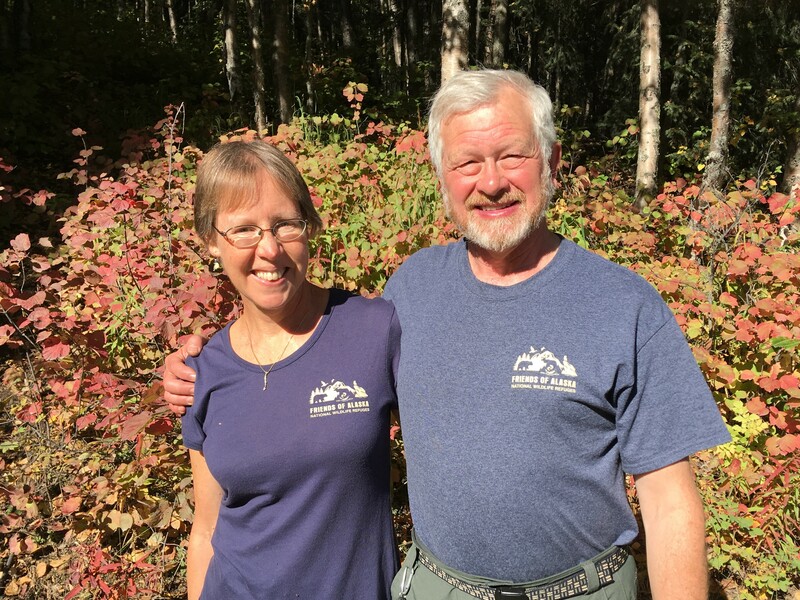 Mary and Hank homesteaded in the area years ago, and were a great source of information about Desper Creek, our destination for our canoe trip. 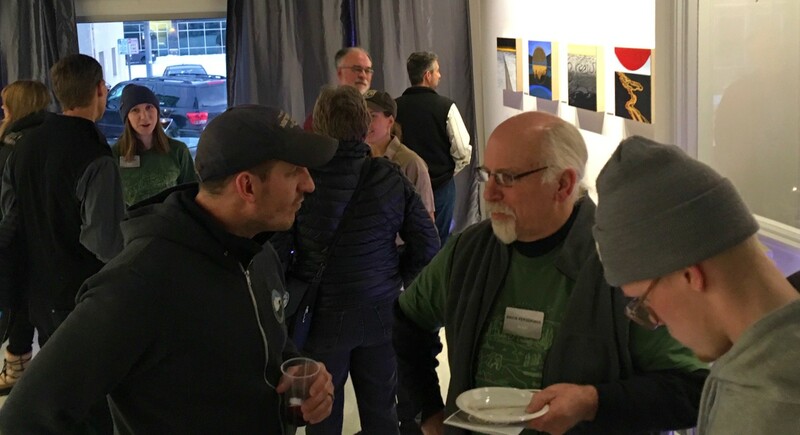 A fun evening was shared by all. 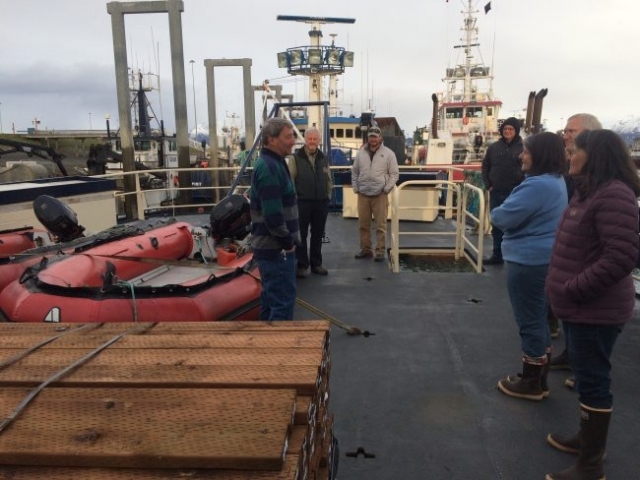 Friday morning the group met with Refuge Manager Shawn Bayless and his staff. 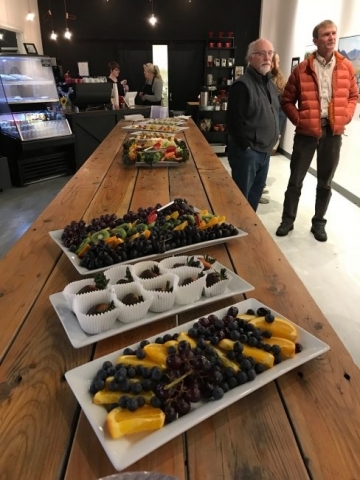 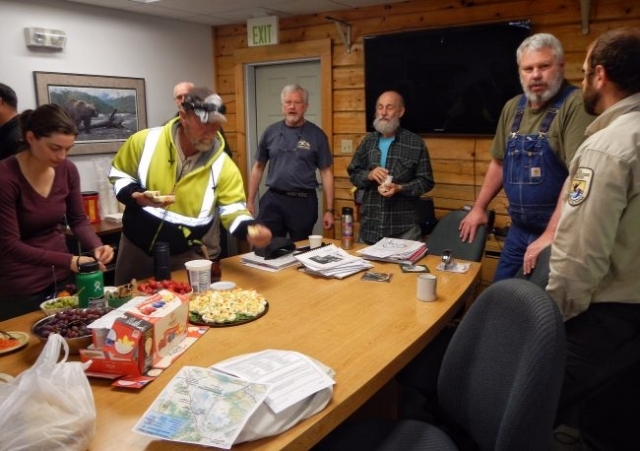 Over a yummy breakfast, topics covered included: an overview of refuge programs and priorities, including the refuge’s boreal lynx project; priorities and staffing challenges in a declining budget environment; potential opportunities for Friends of Alaska Wildlife Refuges to help the refuge; and the Friends upcoming weekend canoe trip on Desper Creek. 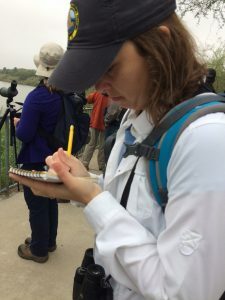 A number of ideas were generated for assistance friends could provide, including help with bird banding and river patrols, as well as assistance putting on the May migratory bird festival. 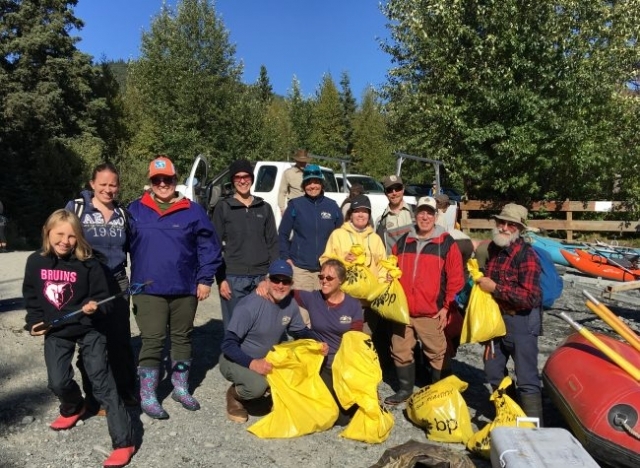 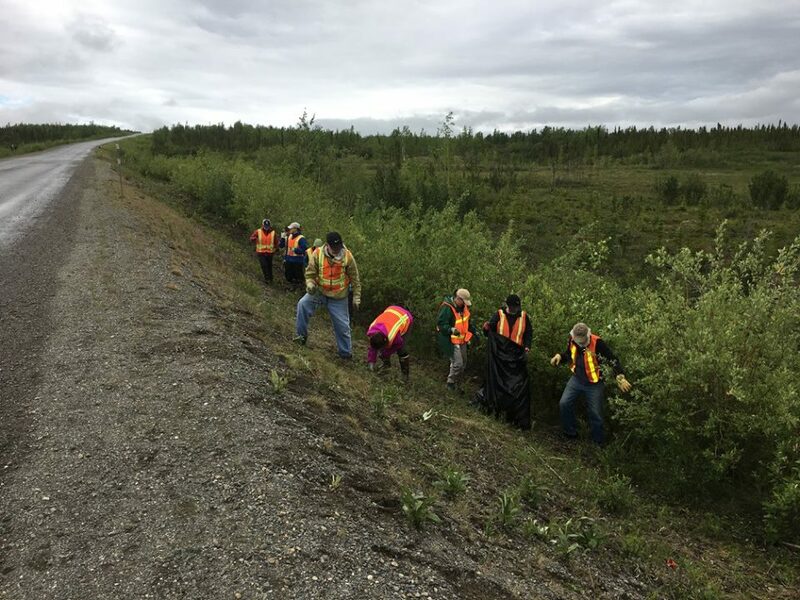 A friends refuge visit includes a volunteer project – so after our breakfast get together we helped refuge staff pick up litter on its “Adopt a Mile” mile along the Alaska highway. 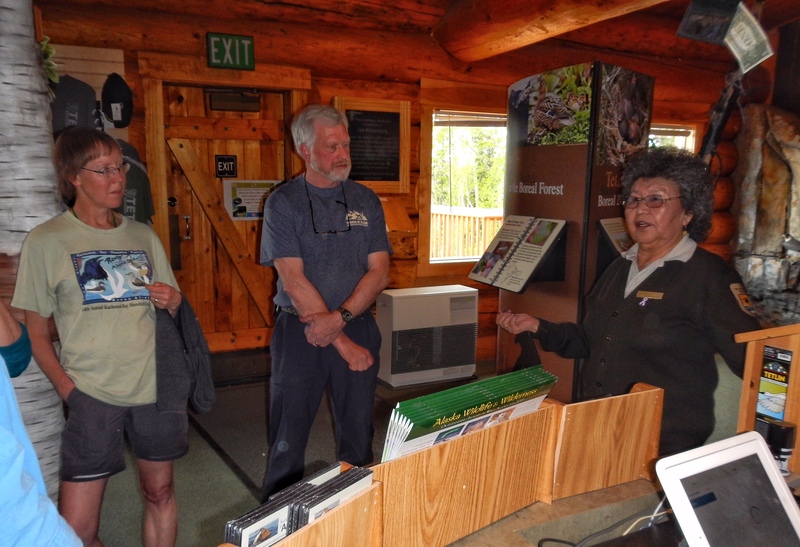 After lunch, the group headed out to the Refuge Visitor Center, located on the Alaska highway a few miles from the Canadian border. 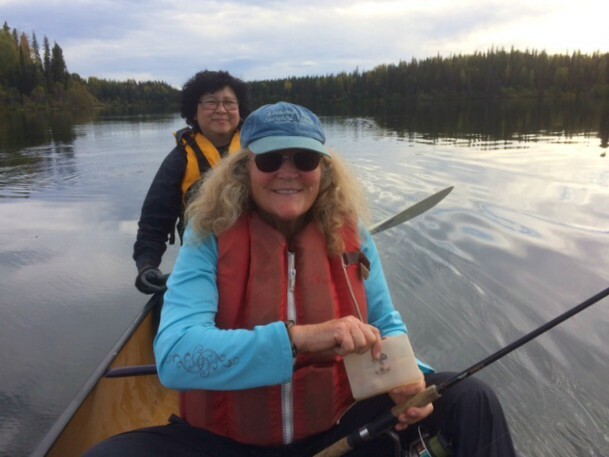 Cora and Sylvia, two long-time refuge employees who grew up in nearby Northway, shared their extensive knowledge of the refuge and its resources with us. 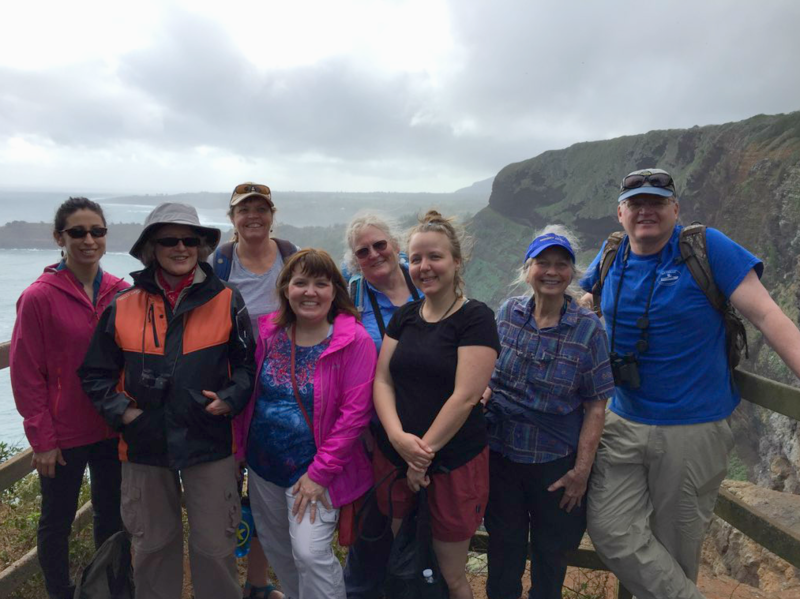 What a wonderful visit we had with these two ladies! 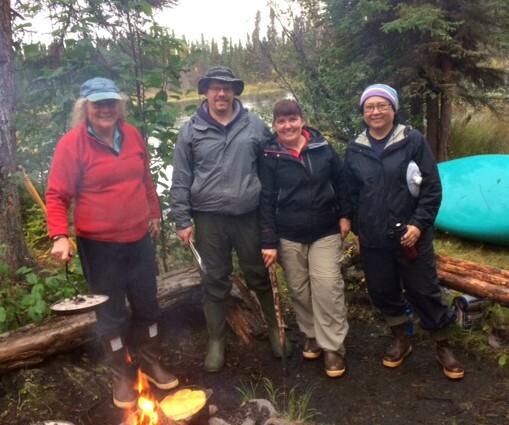 Our home for the night was Deadman Campground, in Tetlin where we spent the evening bird watching and socializing. 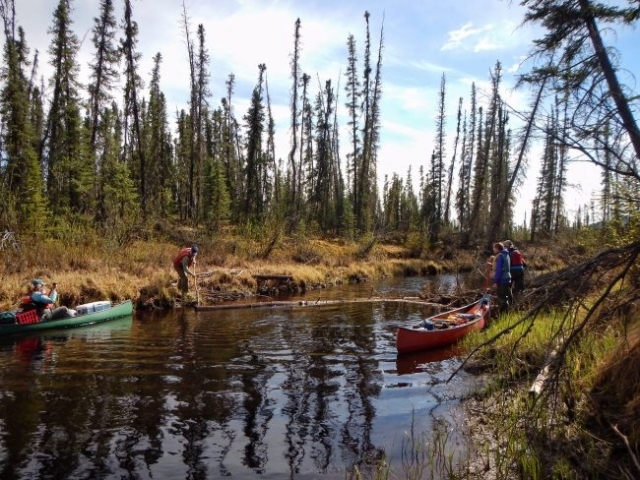 Saturday, Sunday and Monday we explored Desper Creek by canoe. 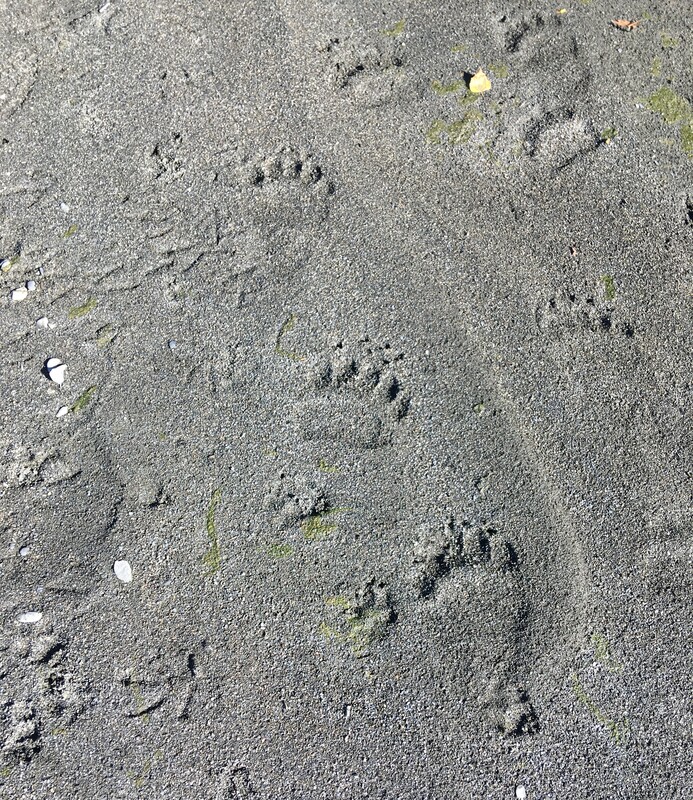 This was a great way to immerse ourselves in Tetlin NWR. 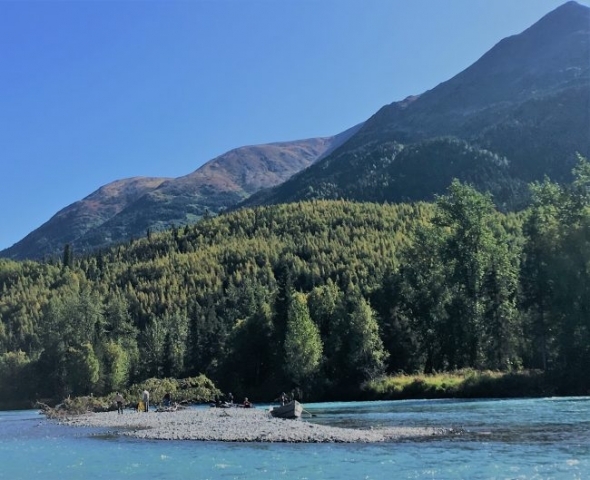 Our home for two nights was a beautiful camping spot 3 miles in, on a narrow peninsula surrounded by Desper Creek. 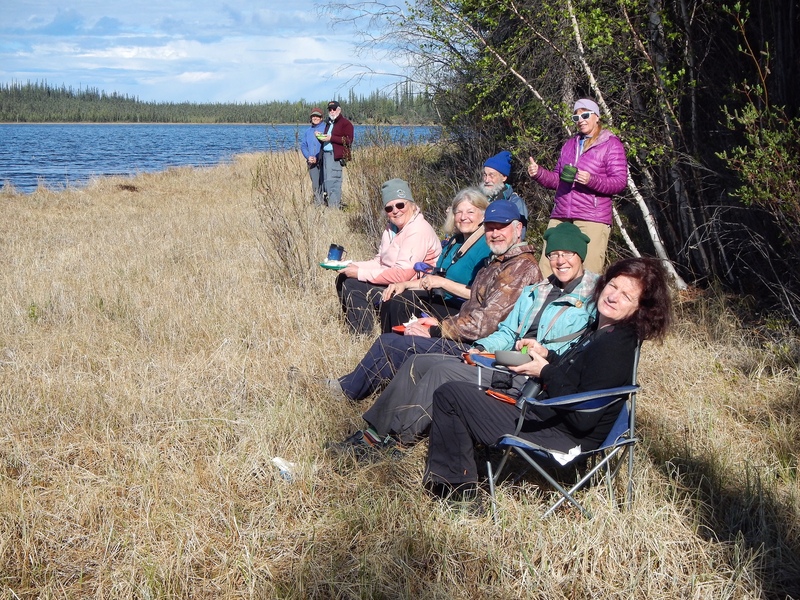 We set up camp under a raven’s nest, filled with four young birds who looked like the were ready to fledge. 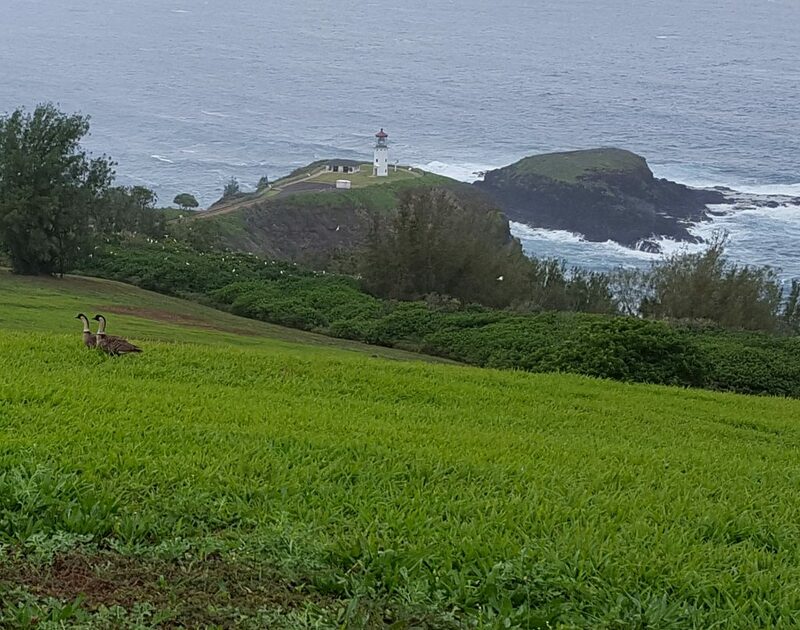 What a noisy group they were, especially when Mom or Dad brought them food(which happened all hours of the day and night)! 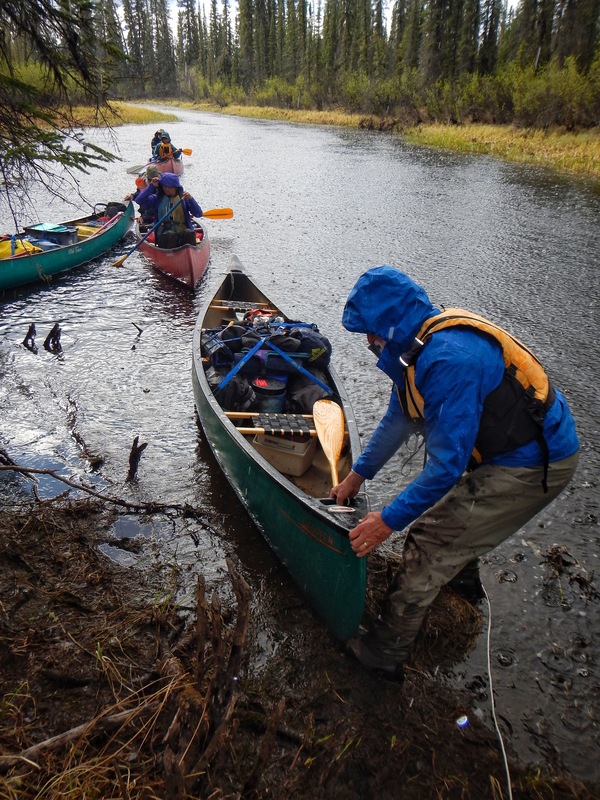 The layover day gave us time to explore on foot and by canoe the nearby refuge areas. 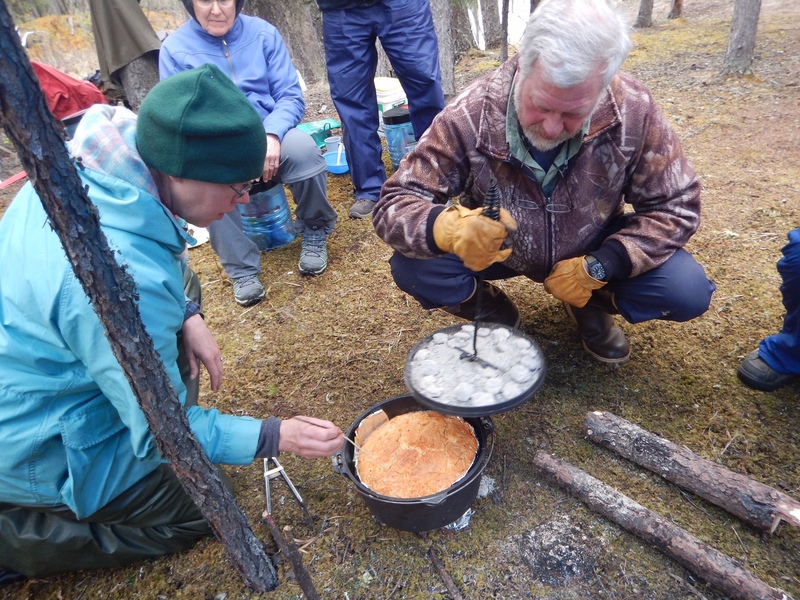 After a great weekend (including delicious Dutch oven cooking by friends member Dave), we all set off for home. 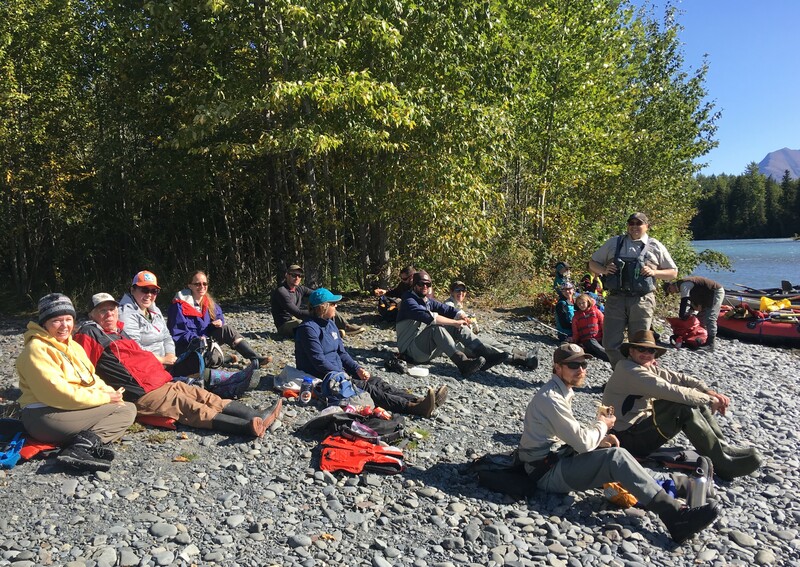 What a wonderful time learning how we may be of assistance to Tetlin NWR, exploring the outdoors in Alaska, and making new friends. I am already looking forward to the next Refuge Discovery Trip, organized by our fun & fearless leader Poppy Benson. 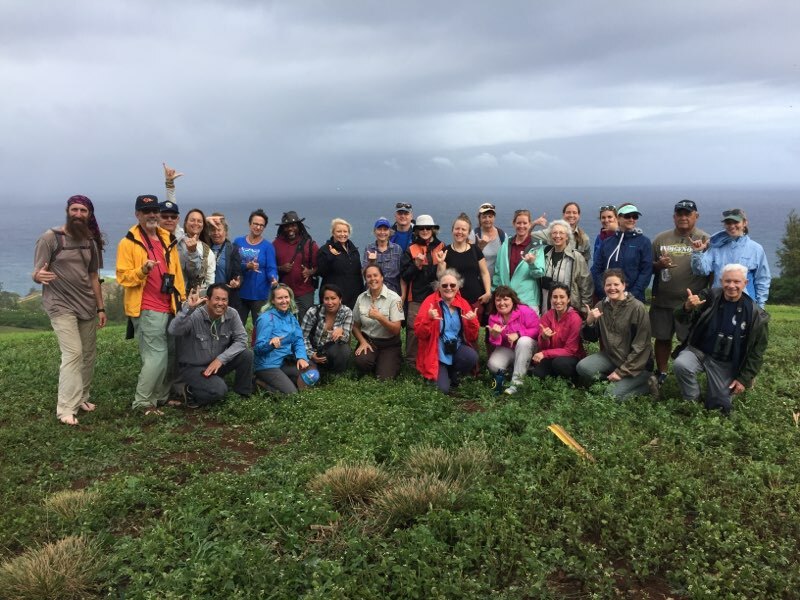 Our Alaska Friends Board and the Pacific and Hawaiian Islands Friends Boards attended a workshop, along with USFWS and Refuge Association staff on Kauai this past January 2018. 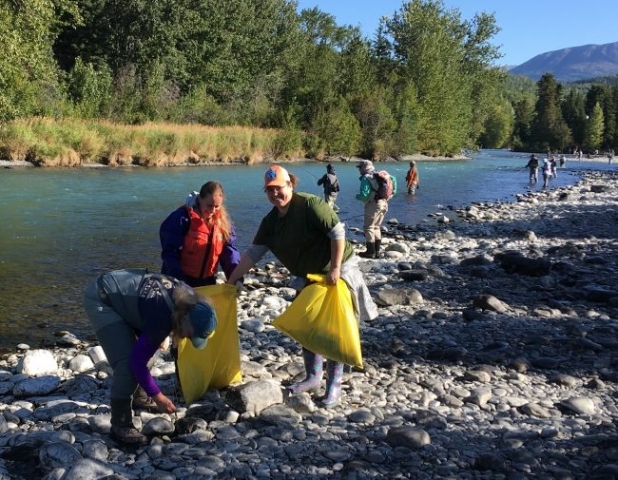 This opportunity was funded by grants from the National Fish and Wildlife Federation (NFWF). 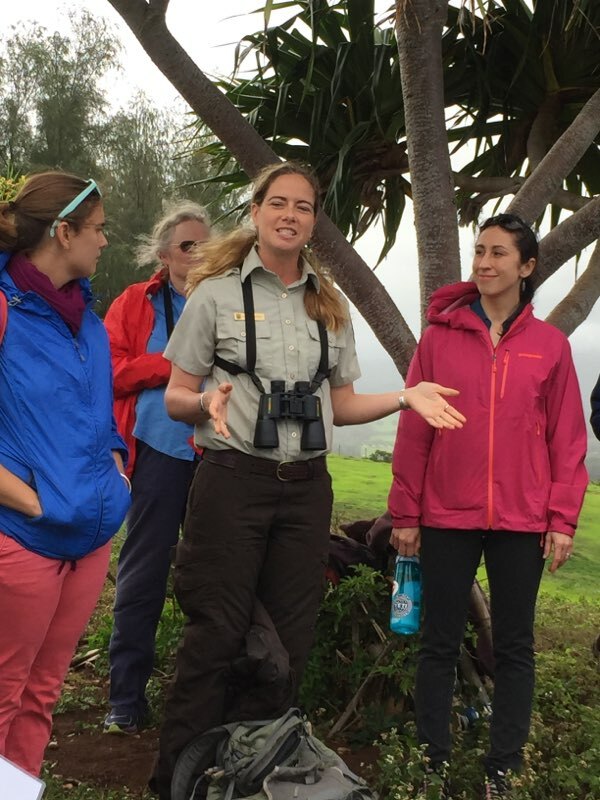 We were also treated to two very special field trips, with visits to Hanalei NWR and Kilauea Point NWR & Light House. 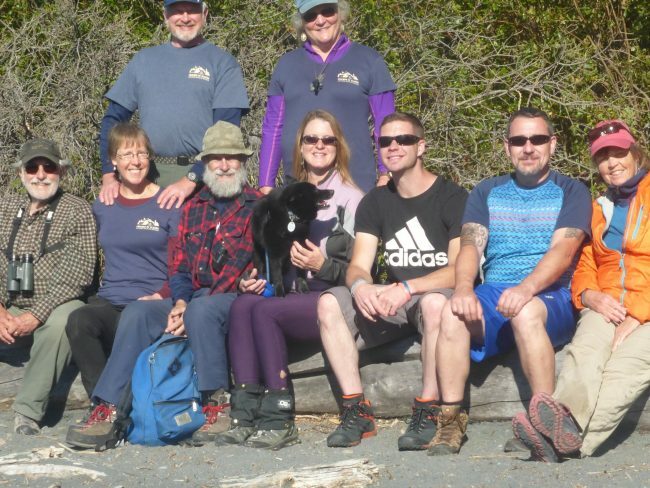 We made lots of connections, learned new ways to support our refuges, and shared ideas, but most importantly, we made FRIENDS. 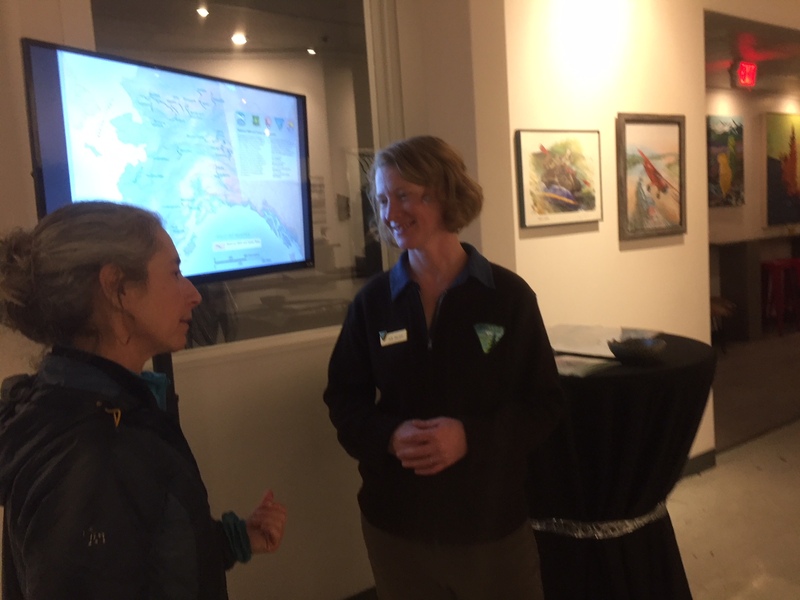 This past November, Friends and Kachemak Bay Shorebird Festival Coordinator Robbi Mixon traveled with USFWS Visitor Services Manager Kara Zwickey to one of the biggest birding festivals in the nation- Rio Grande Valley Birding Festival. 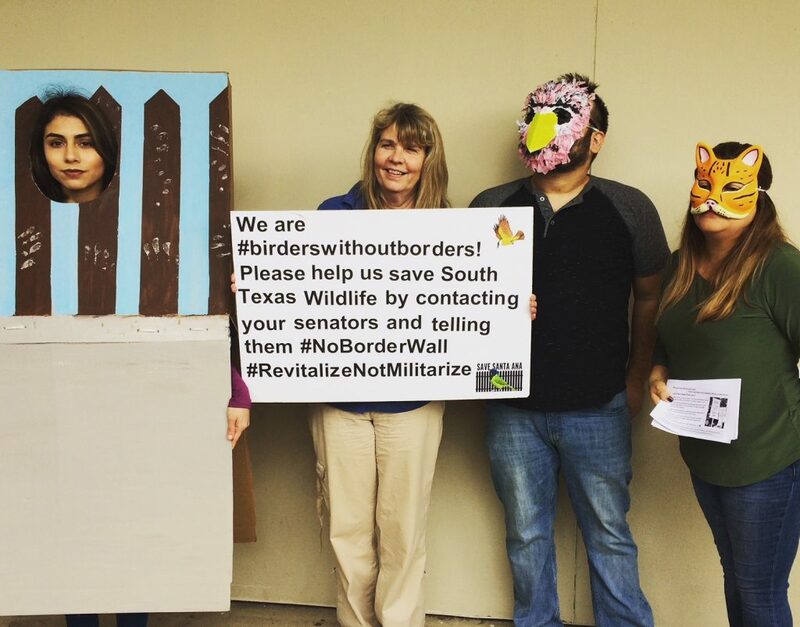 Located near the coastal border of Texas-Mexico, the area offered hundreds of bird species, many new friends and connections, and gave our organization many new ideas for our own festival. 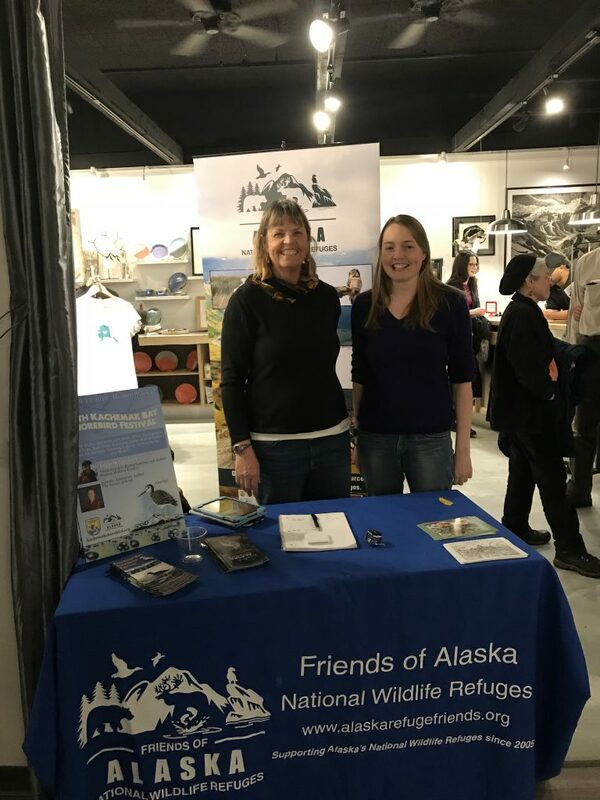 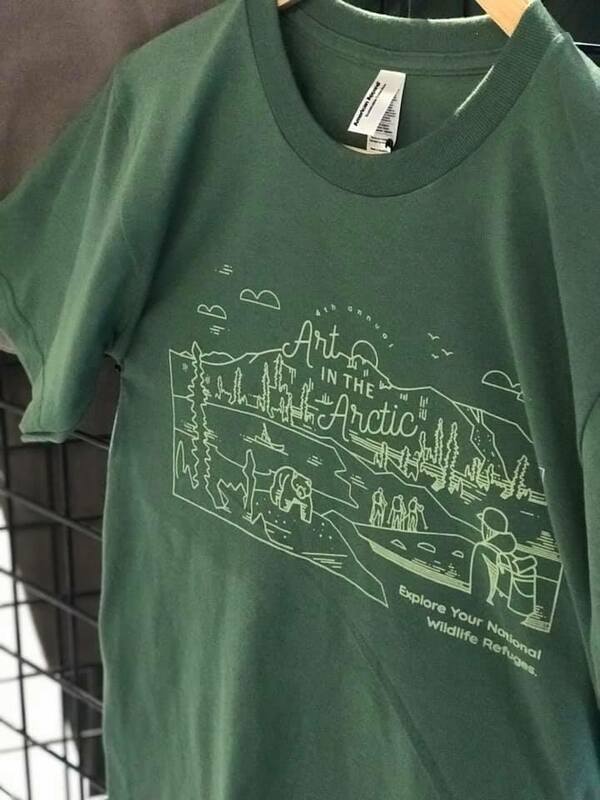 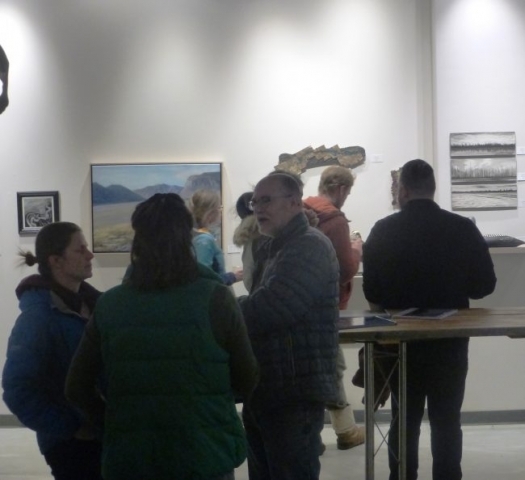 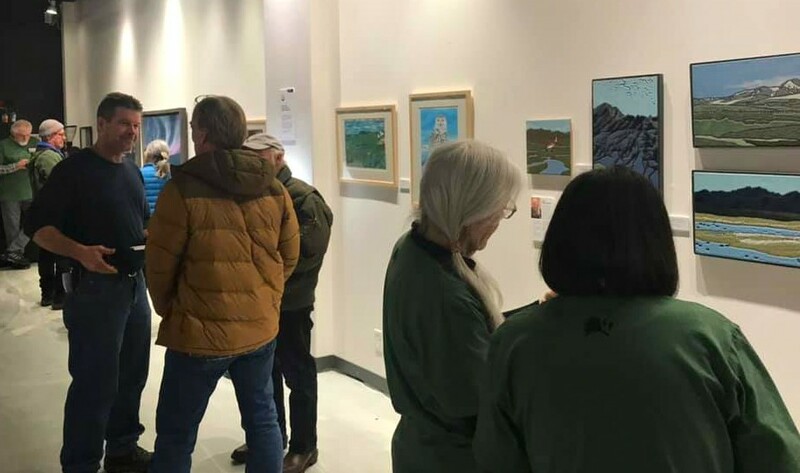 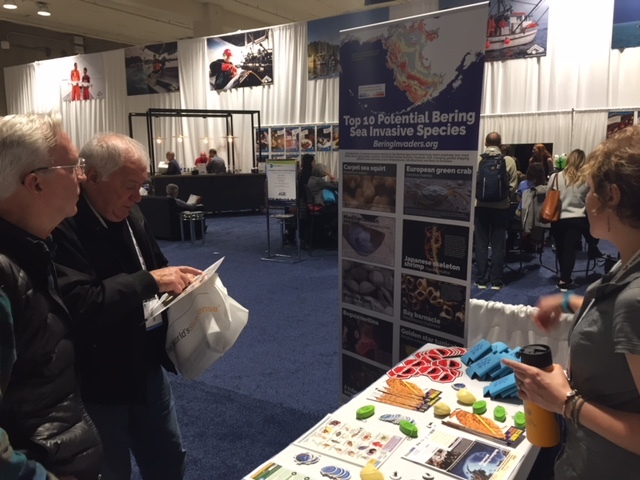 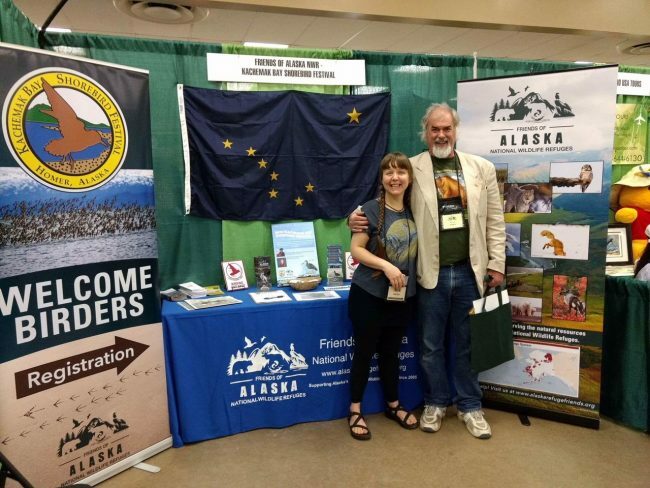 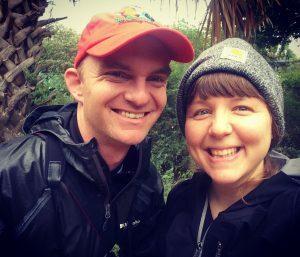 Over the course of the 4-day festival, Robbi and Kara talked to hundreds of attendees about Alaska’s 16 National Wildlife Refuges and encouraged them to attend the Shorebird Festival. 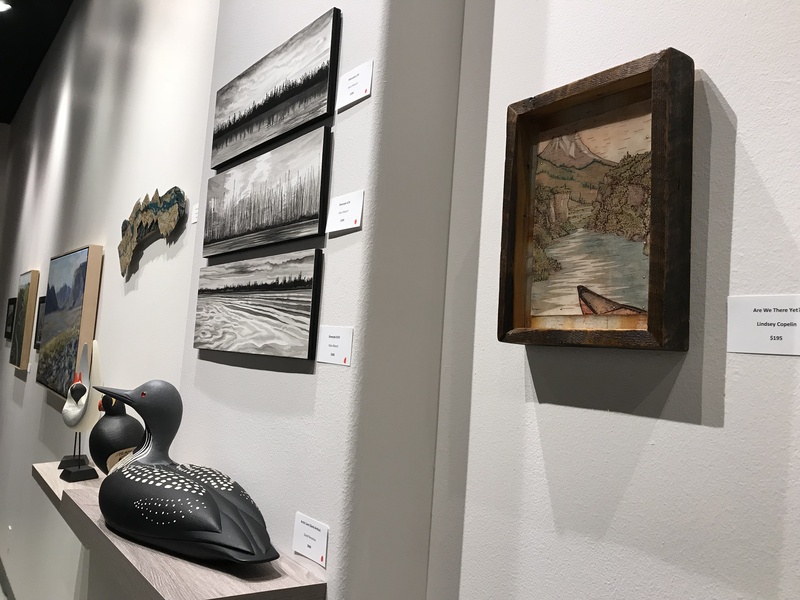 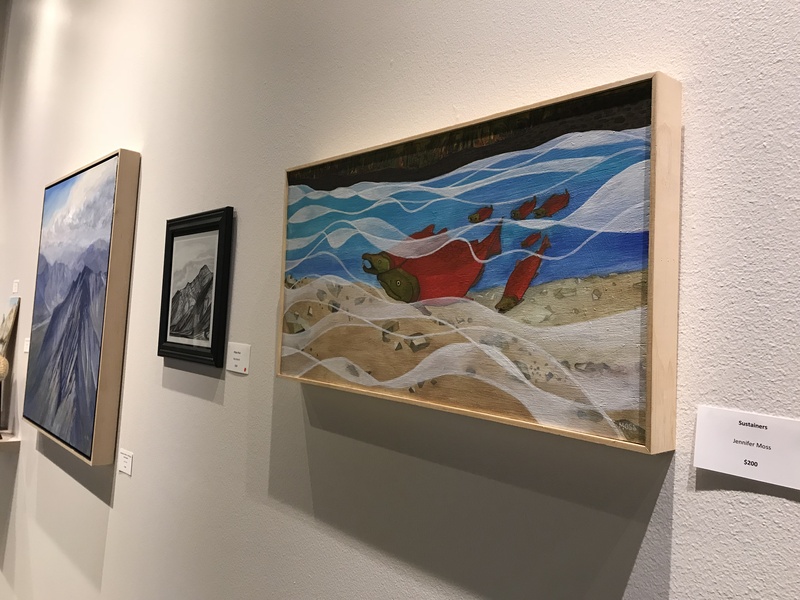 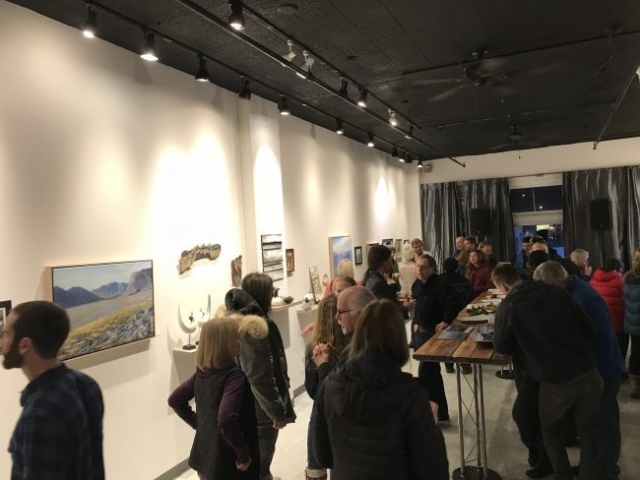 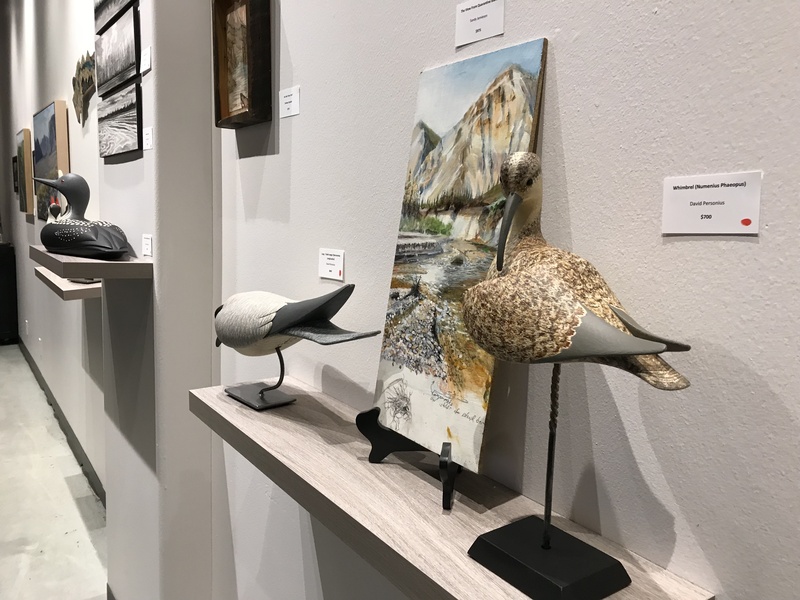 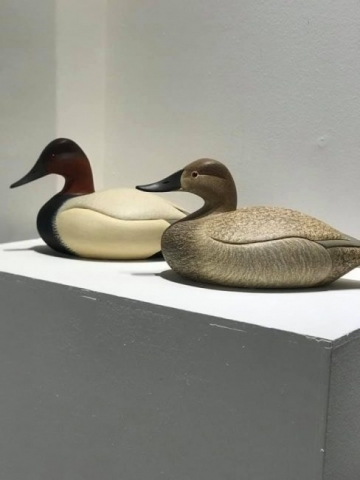 They met with the directors of both the Rio Grande Valley Birding Festival and the Space Coast Festival (Florida), as well as reconnected with previous Shorebird Festival Keynotes Noah Strycker and Kevin Karlson. 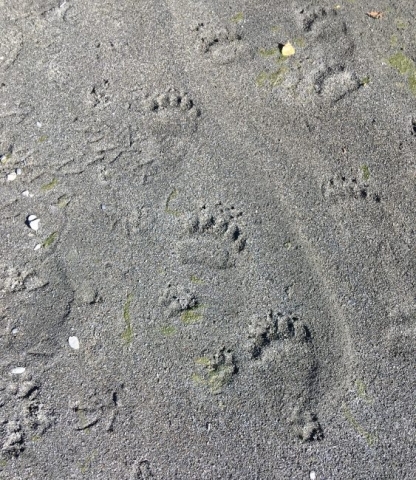 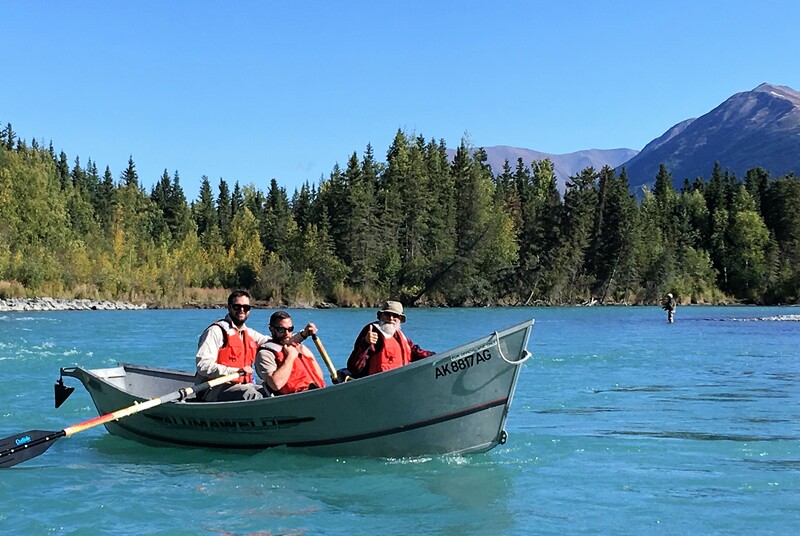 The first ever Friends Discovery Trip to the Kenai National Wildlife Refuge was a success! 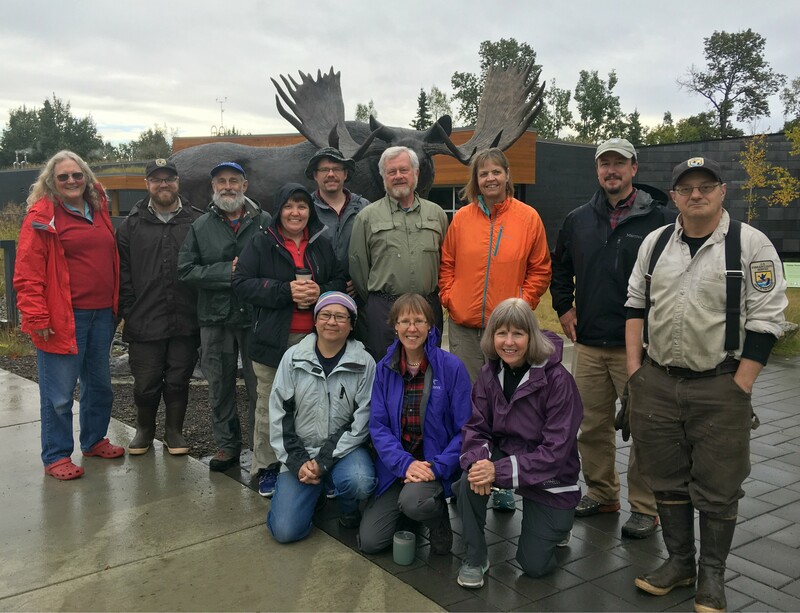 Eleven Friends met on a rainy Saturday fall morning with the Kenai Refuge manager Andy Loranger and staff to learn about the unique volunteer opportunities within the Refuge: from front desk, to adopt a trail, to refuge advocacy. This most visited and accessible refuge in Alaska has experienced budget and staff cutbacks. Visitor center manager Leah Eskelin shared a laundry list of volunteer opportunities suitable for locals with an afternoon to spare or Anchoragites who could give a weekend. The clouds parted just in time for us to drive through golden fall leaves to launch our canoes at the Swan Lake Canoe Route trail head, 20 miles north of Sterling. 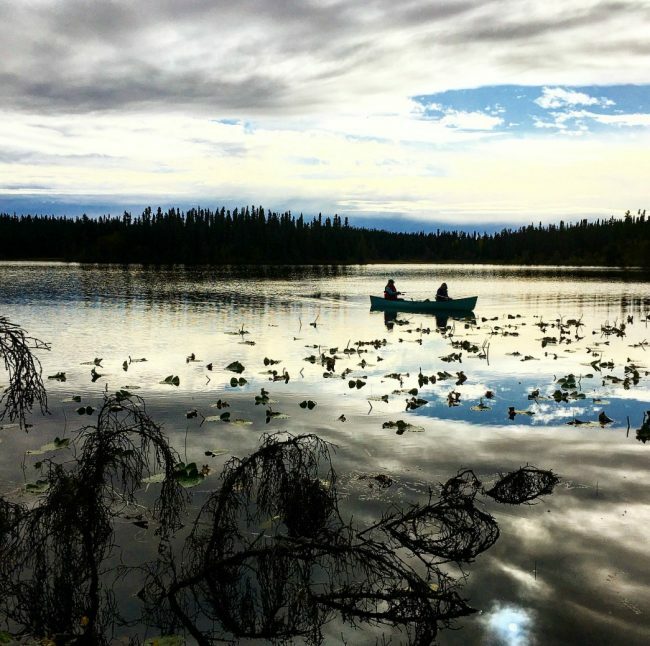 We paddled across Canoe Lake to set up camp for our evening activities. Lots of awesome Dutch oven cooking and late night fraternizing around the campfire followed, including Robert Service poems dramatized by Friend member Tom Choate. 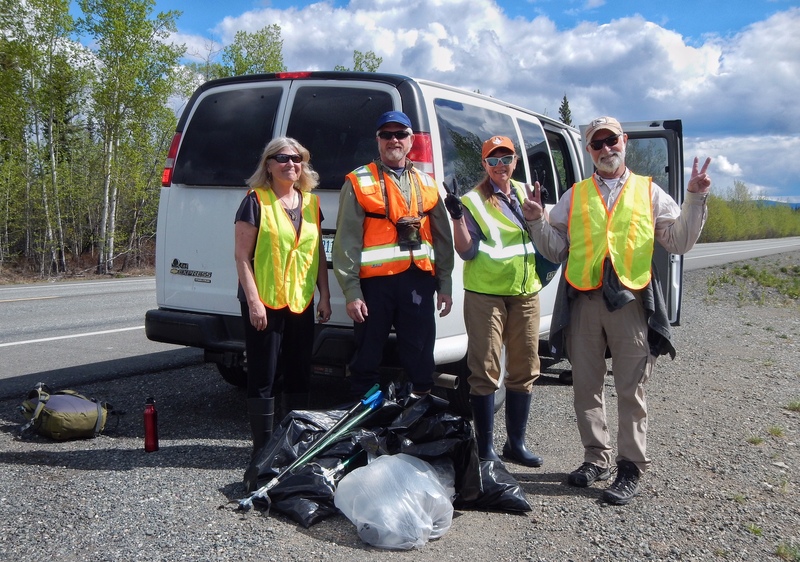 We were accompanied by two refuge staff who coordinated our volunteer trail clearing. The next day, we paddled to Waterfall Lake to do some trail clearing and exploration of the lake and its’ lovely island. 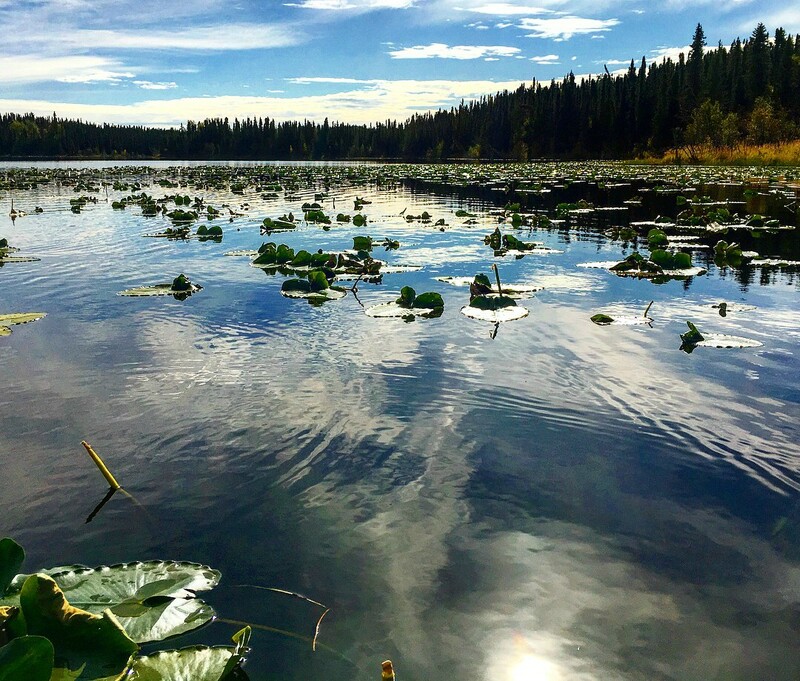 The calm and clear waters offered a perfect reflection of the beautiful fall colors of the lake. 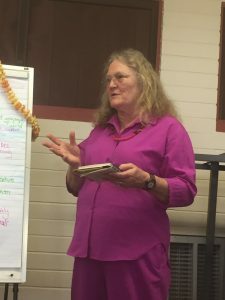 Barb Veeck reports, “As a new member, I felt that I gained awareness of the purpose of the Friends program and enjoyed meeting other members. 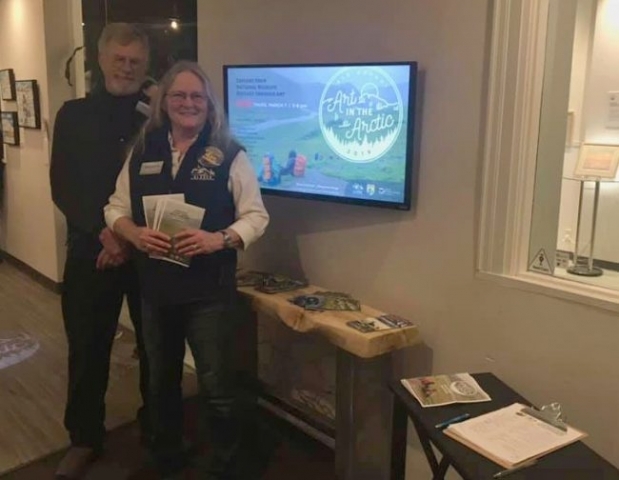 It was fun to discuss future volunteer and group trip activities such as this one. 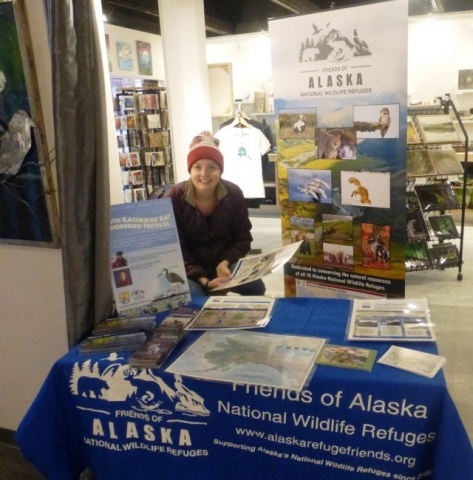 We encourage all of you to get out on a refuge through Friends sponsored trips or volunteer opportunities or with your own family. 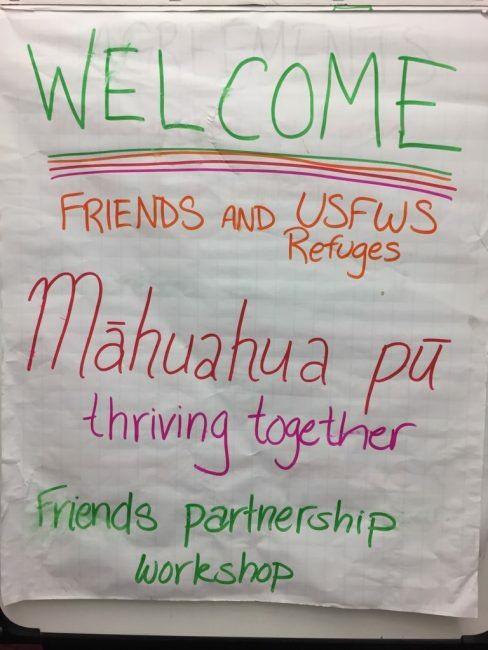 The Refuges need us and we need them. We just returned from our June 2017 week of pulling invasive weed species for the Friends of the Alaska National Wildlife Refuges. 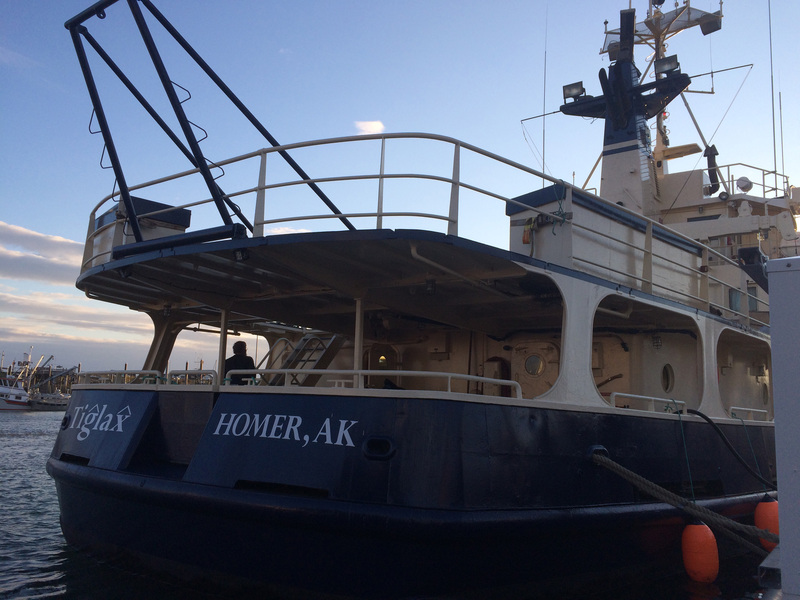 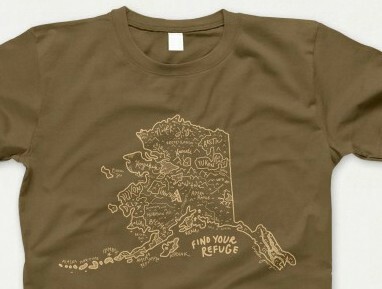 The volunteer work took us from Homer all the way north almost to the Arctic Ocean. 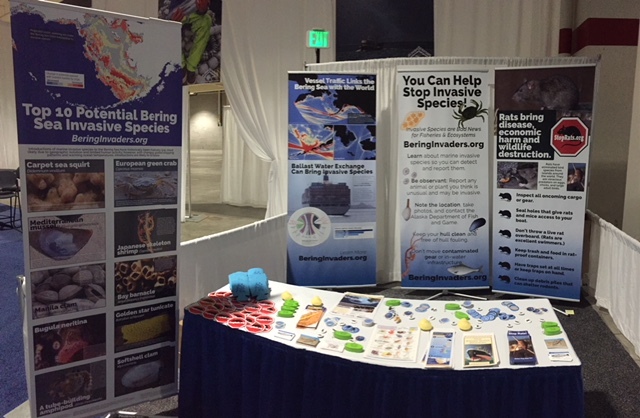 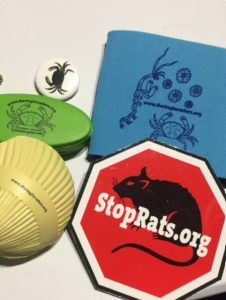 It was a great experience and we hope we contributed to keeping invasives from spreading even more. 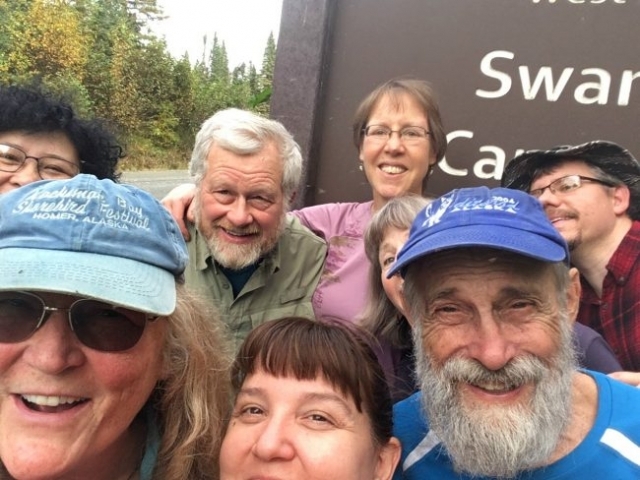 Monday morning we left Fairbanks early in two vehicles with the full weed pulling crew. 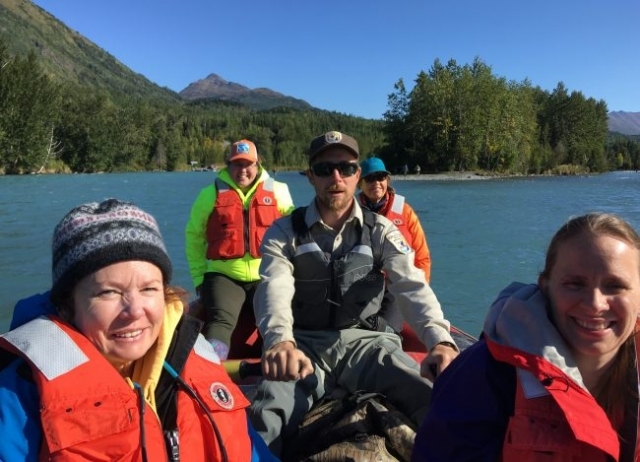 A Fish & Wildlife biologist was the agency head for the crew, there was a summer intern working with him, and two other Friends volunteers. 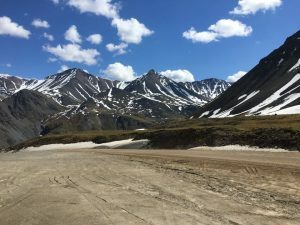 This is a typical view of the Dalton Highway or Haul Road. 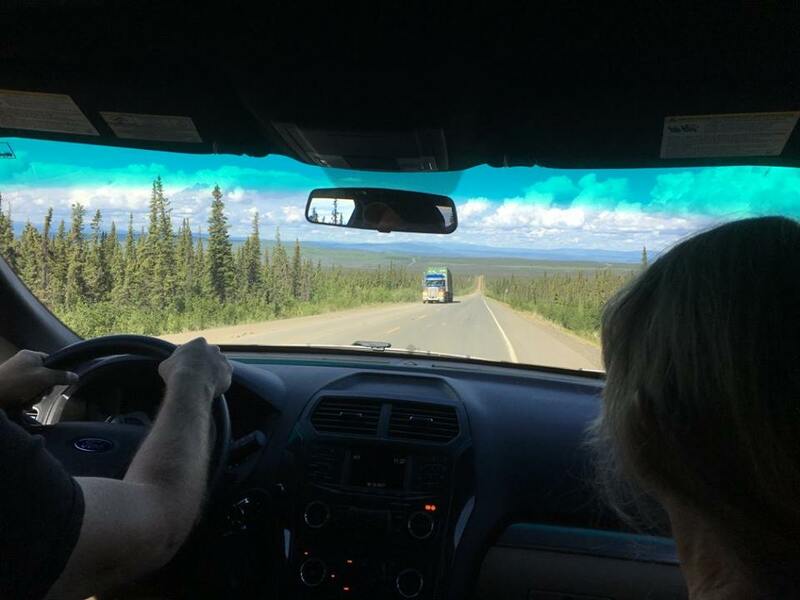 The reason it is called the Haul Road–lots of big trucks bringing stuff up to and down from Prudhoe Bay. 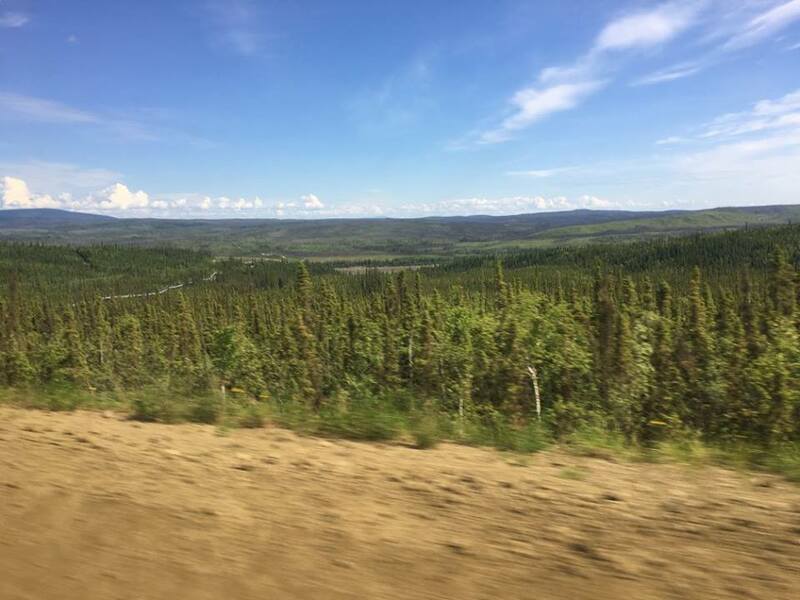 Typical Black Spruce forest- some of these trees are 200 years old! 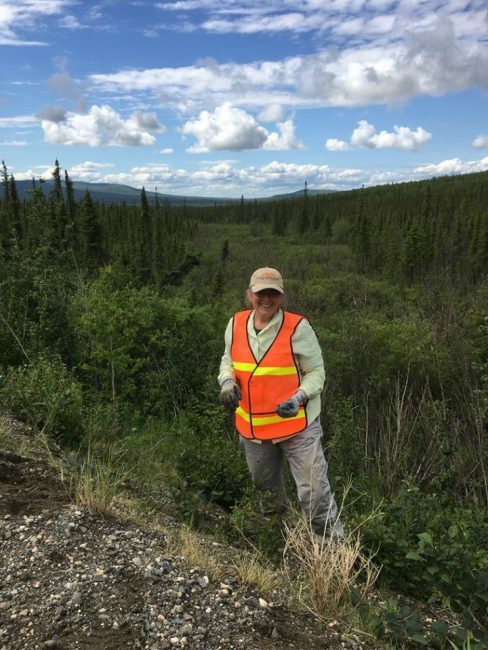 Growing on permafrost tends to make for a hard life and stunted growth. 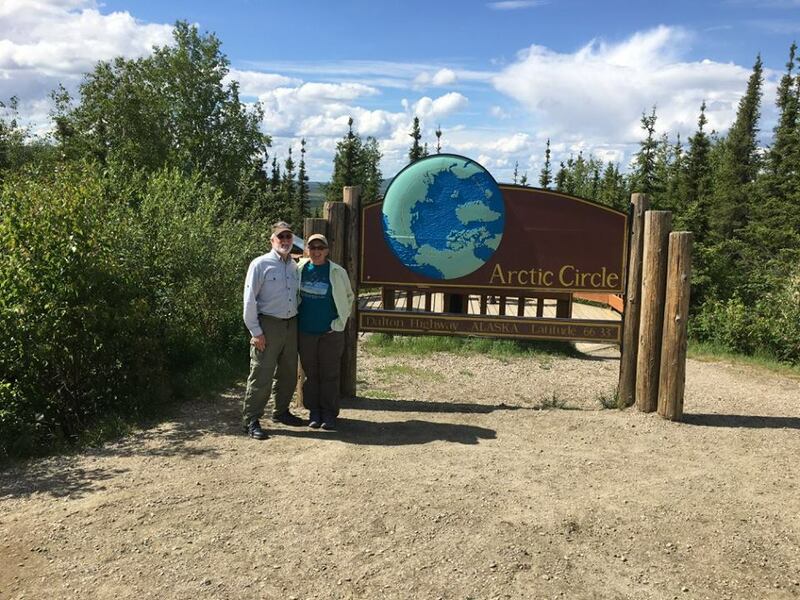 Made it to the Arctic Circle. 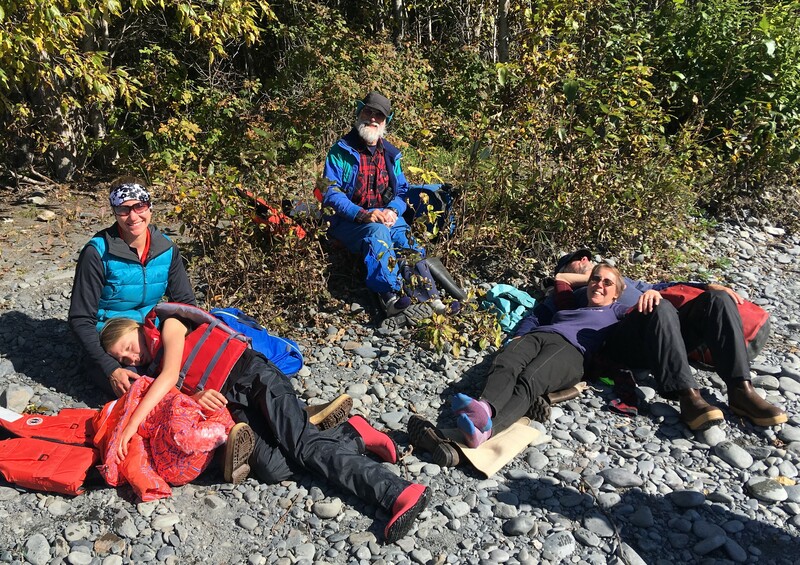 We pretty much had 24 hours of daylight the whole time we were up there. 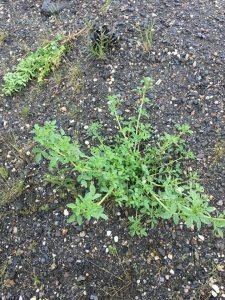 This is what we were looking for– white sweetclover. For about 150 miles of the highway, anywhere a river crossed the road, we pulled the clover we found. We split up into pairs and pulled weeds about 100 yards up from the bridges on both sides. The idea is to not allow the sweetclover to flower and go to seed so the seeds can’t travel down the rivers and invade the refuges. 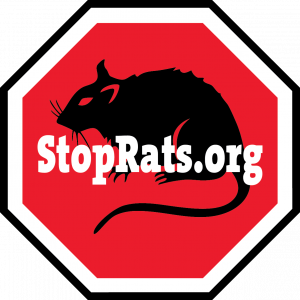 One mature sweetclover plant can produce 350,000 seeds and they are viable for 80+ years. 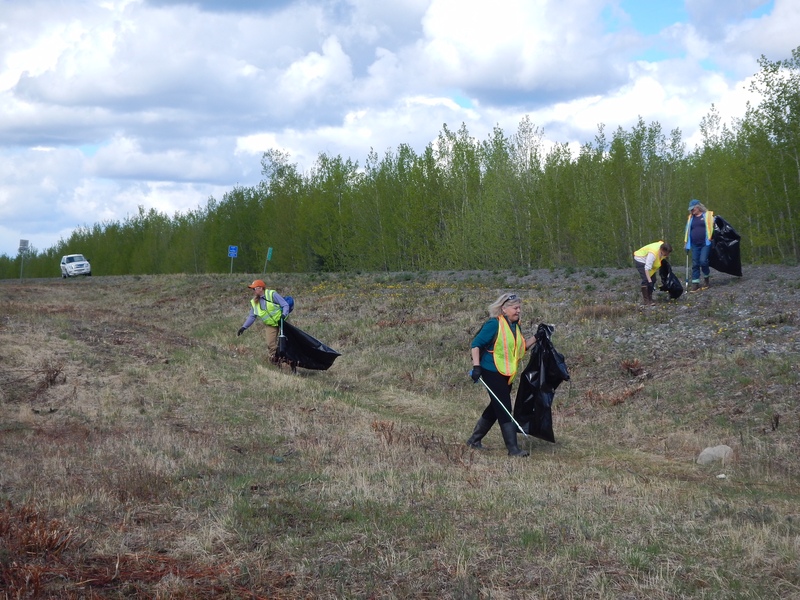 The crew working a particularly heavily grown-over area. 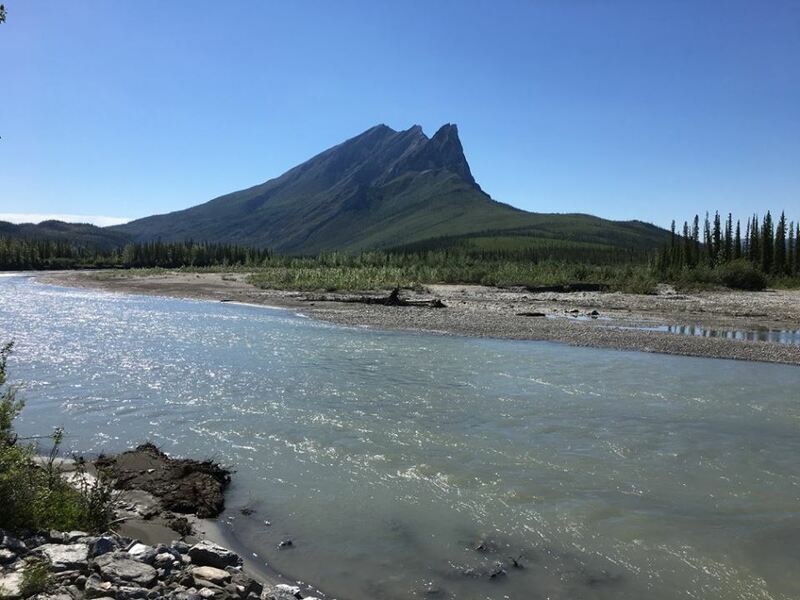 Our final morning and we headed north out of Coldfoot (the two previous days we worked to the south.) 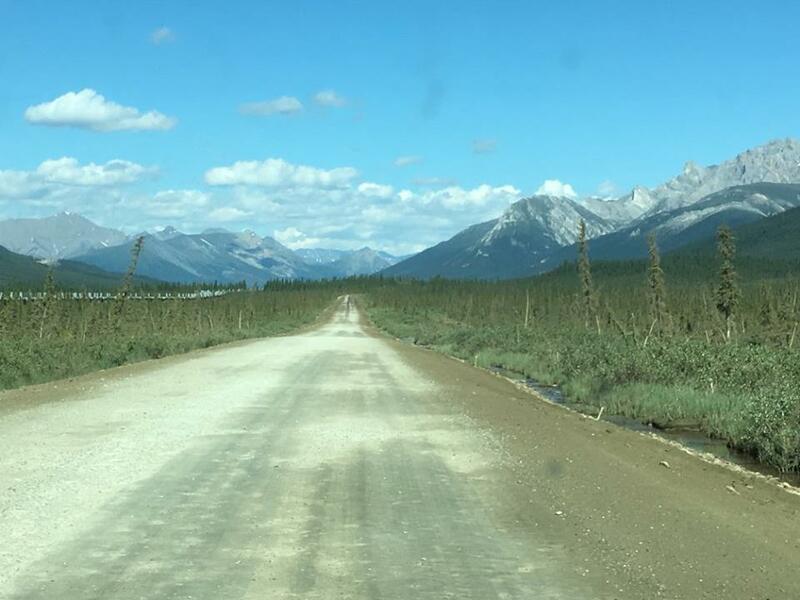 The mountains you can see are the start of the Brooks Range. The views were spectacular, like Sukapak (mountain – below).